State Bank of India Clerk Notification 2019 will be released in the month of January. Apply Online SBI Clerk Vacancies. Bank Job seekers can check SBI Clerk Notification 2019. Interested Aspirants must read the SBI Clerk 2019 Recruitment Notification carefully before applying online. SBI Clerk Online Application Link available from 2nd/3rd Week of January 2019 on www.sbi.co.in and also at the bottom of this page. Graduates can apply for these SBI Clerk Recruitment on or before the last date. For more details regarding the SBI Jr Associate Jobs 2019 follow the below article. 1.6.1 How to Apply for SBI Clerk Recruitment 2019? There is heavy competition for the State Bank of India Clerk Jobs. So, the Interested candidates must start the preparation as early as possible. Aspirants must satisfy all the eligibility conditions before applying online for the SBI JA JAA Jobs. The Minimum Age required to apply for this SBI Clerk 2019 Recruitment is 20 years. The details about the Educational Qualification, Age Limit, Pay Scale, Application Process, Examination Fee, Selection Process of SBI Clerk Recruitment are clearly available below. You must apply for the State Bank of India JA JAA Jobs if fulfills all the Eligibility Conditions. Post Name Clerical Cadre Posts. Application Starting date Third Week of January 2019. Last date for SBI Apply Online February 2019. The State Bank of India released the SBI Clerk 2019 Notification. So, the interested aspirants can keep visiting this page for latest updates State Bank of India Clerk Exam details and SBI Clerk Recruitment 2019-2019. The Notification for State Bank of India Clerk Recruitment 2019 is not yet released. We will update the state wise SBI Clerk Vacancies after the official announcement. The Applicants should have the Educational Qualification and Age Limit for SBI Clerk 2019 Jobs as available below. Candidates must attain the below conditions as on 01/01/2019 for State Bank of India Clerk Recruitment. You may also refer the SBI CLERK Notification Official PDF for complete info. 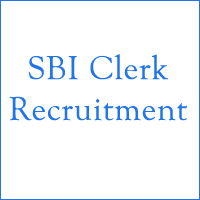 Here, we have provided basic information about SBI Clerk Recruitment Eligibility. Aspirants applying for JA JAA Posts must complete Graduation Degree/ or its equivalent degree from any recognized Institute or University or equivalent qualification recognized by Central Government. The Age of the Applicant for State Bank of India JA JAA Jobs should be as available below. The Relaxation of Age for different Categories of SBI Clerk Recruitment 2019 is applicable as per the rules of the Government. Hence there are a huge number of vacancies, the competition will be high for the Bank Jobs. So, the candidate’s career in Banking Sector will be decided based on their Performance levels in the Selection Process. Therefore, check SBI Clerk Selection Process for 2019 Clerk Recruitment. Here, you can also find the Application fee & pay scale details of State Bank of India Clerks. The Selection of the Aspirants for State Bank of India Jr Associate Jobs will as per the performance of the Candidates in the below-mentioned process. The Contenders Interested for SBI Clerical Cadre Jobs has to pay the SBI Clerk 2019 Fees or Application Fee through Online mode such as Internet Banking/ Credit Card/ Debit card. The SBI Clerk 2019 Exam Fee Details for SBI Clerk Jobs available below. For General/ OBC Category Candidates: Rs 600/- along with intimation charges. SC/ ST/ PWD/ XS Categories: Rs 100/- with intimation charges. The SBI Clerk Salary 2019 fixed as Rs 11,765/- to 31,540/- per month as per the State Bank of India Notification. The link to apply online for SBI Jr Associate Jobs available. Aspirants must regularly visit our site for more details regarding the State Bank of India Clerk Jobs. Step by Step Process of www.sbi.co.in Clerk Registration is available below. Click on Apply Online for SBI Clerical Cadre Posts. Submit the filled online form before the last date. You must take a printout of the application for further reference during the selection procedure. The Individuals are eagerly waiting for the Bank Jobs and its time for them to start the preparation as early as possible. The Candidates can check the detailed SBI Clerk Exam Pattern here. The Topics included in the State Bank of India Clerical Cadre Recruitment 2019 with detailed information is available below. The Online Test will be conducted for a total duration of 45 minutes with the maximum marks of 90. For every incorrect answer, there is Negative marking. Follow the Pattern of the Exam as per the Notification. The Admit Cards for the SBI Jr Associate Jobs will be available on the official site as per the declaration. Download the admit cards from the official website www.sbi.co.in or from our site. SBI Clerk 2019 Admit Card is the important document to be carried to the examination centre. The Date of Examination and Venue Date is provided in the Hall Ticket which is very important for the Candidate. Without the hall ticket, the candidate is not allowed to attend the online test. SBI Officials will declare the results of Clerical Cadre Posts after the successful completion of the Online Written test at allocated exam centers. We also provide the results for the candidates who have attended the SBI Clerk Exam. The results are available at the official page www.sbi.co.in. You must check the latest updates of State Bank of India JA JAA Results here. For complete information about the State Bank of India Clerk 2019 Recruitment, you can download Official SBI Clerk 2019 Notification. Therefore download links of SBI CLERK Official Notification PDF attached below. the form is still not available for sbi clerk ja in the website sbi.co.in.As the form should be available from 20 oct 2017.